There is no easier way to support Koinonia! AmazonSmile is a simple and automatic way for you to support Koinonia Family Services without doing anything extra or out of the ordinary. Shop AmazonSmile for everything you buy on Amazon, at no cost to you. Exact same low prices, vast selection of products, no difference in service. Convenient shopping experience that allows you to donate to Koinonia. Amazon will donate a portion of your purchase price with no cost to you. How do I use Amazon and donate to Koinonia? Use the button below to visit smile.amazon.com Koinonia Family Services Smile Page. 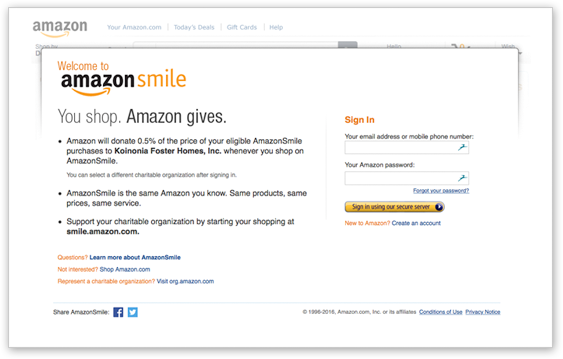 Login to AmazonSmile using your Amazon.com account. If you don’t see the smile page then logout. Search products & buy from your wishlist just as you’ve been doing, and Amazon will give back to Koinonia because of you.